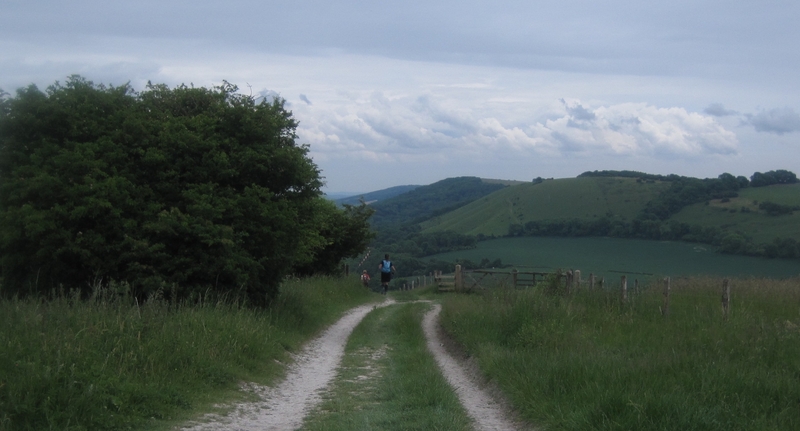 My decision to sign up to the SDW100 was a visceral one, a drawing of a line in the sand. 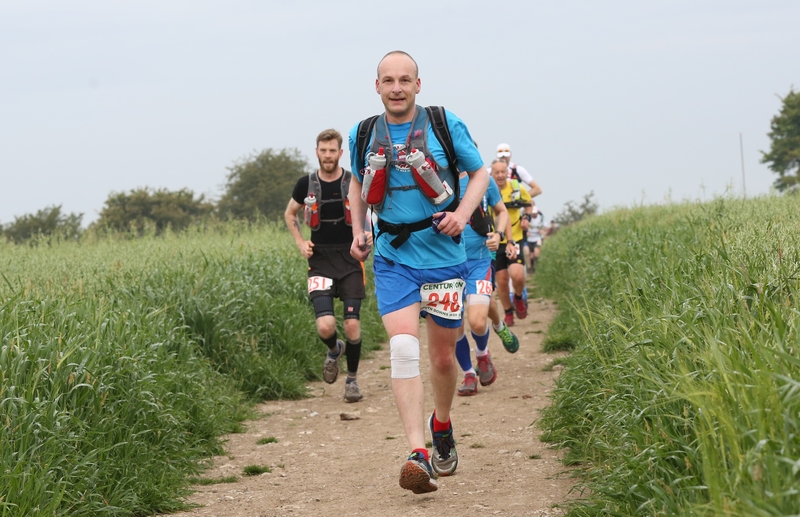 Entries opened 2 weeks after my DNF at the NDW100 and I signed up on my smartphone whilst holed up in a grotty hotel in Ostend at the tail end of a european road trip. One thing was certain I was not going to be DNF’ing the SDW, 110% no way. Weight wise though things slipped again. In latter years my body has definitely lost the ability to signal to my brain that I am full. As someone who likes nothing better than to graze on food whilst reading the paper after a hard day at work I often would eat my fill, fancy something sweet and then marvel at my ability to eat crackers and cheese one after another until either the crackers or the cheese ran out. Addicted I suppose to the to the taste and the feeling of the food going into my stomach ?!? I don’t know whether pushing ones body to complete these long distances, exacerbates the failure of what I now know as leptin to work the way it should but in any event I started 2016 at 14St 5 ½ lbs back to where I was at the beginning of the previous year. A good 2 ½ -3 month abstinence from alcohol and eating like a bird left me around the 12 Stone mark as I approached my first event of the year. The Manchester Marathon at the start of April. The day before the marathon I had felt obliged to buy a new pair of trainers as my current ones were on their way out and had anyway become totally wet through when doing the south manchester parkrun that morning as large parts of the course were ankle deep in muddy water. As these were really quite expensive (Saucony Triumph ISO 2 @ £135.00 ) I decided to keep a mileage log so that I could better gauge when it was time to move onto a new pair. I have never bothered to do this in the past and as a result whenever I started to feel a niggle I was never quite sure whether it was due to my trainers being worn out. 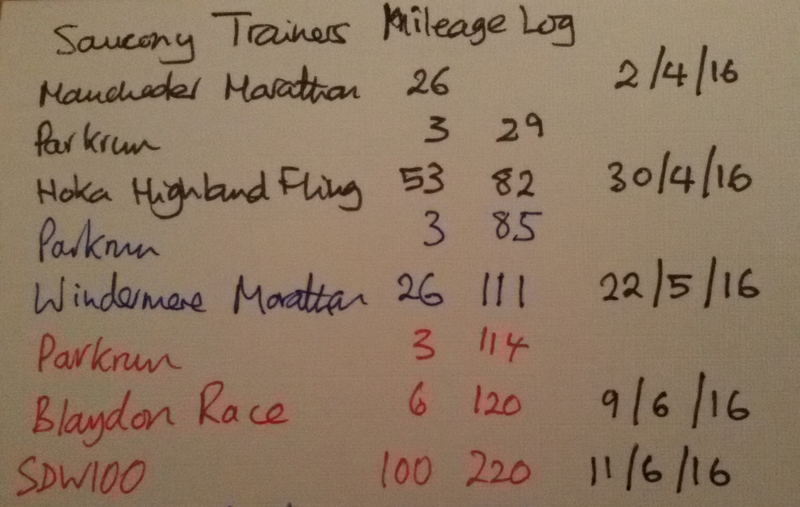 Anyhow, the log does serve to record my training in the lead up to the SDW100. Episodic is the term that comes to mind and it was a good job that I had some events booked in and paid for and so felt duty bound to complete. 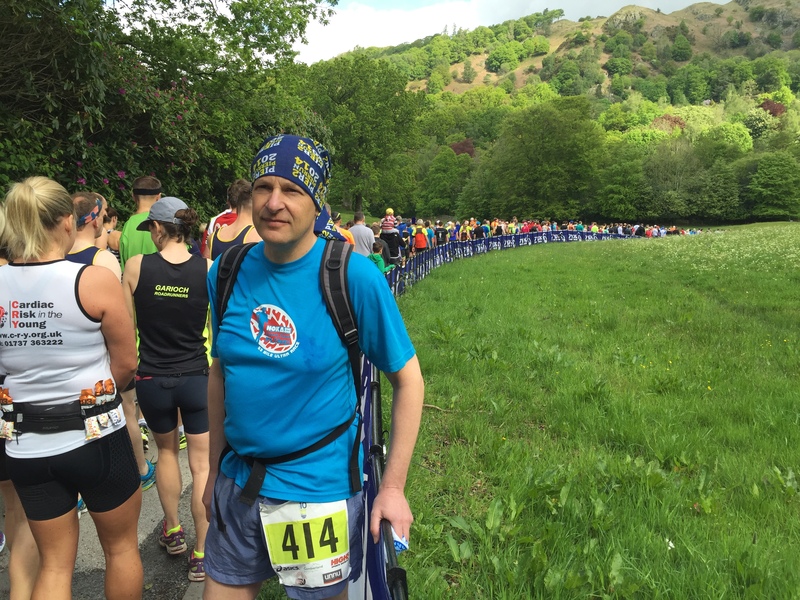 At the Windermere Marathon 22.5.16 Not a very flattering photo 10 ½ Stone + 2 Stone Fat ! The day before the race I left work in Newcastle at 3 pm and after nearly 6 hours of driving, pretty much non-stop, I got down to Chilcomb Sports Ground where I registered, put my tent up and then headed out in search of some food. After driving around Winchester fruitlessly in search of a supermarket I finally happened across a giant Tesco’s just next to where I had left the motorway when I first arrived ! Food and drink I struggle with and tonight would be a case in point. It was Friday night, I was really pleased to have got the drive over with, my tent was up and I didn’t have anything to worry about having got my drop bags all sorted before I left South Shields. I really deserved a couple of beers, so I bought some. I bought some nice food too, bagette , coleslaw, cheese, cold meat & houmus. Now I don’t really drink beer with food I drink red wine, so I bought a bottle, a set of plastic cups, and a FT to keep me occupied. After downing my beers I headed back to the sports ground and parked up as it started to get dark. I stayed in the car & dug into the food and wine enjoying myself (it was after all a mini holiday). The last few people around soon went off to bed and I was left alone in the car reading the paper and drinking my wine. It was c.00.30 by the time I had polished off the last of the wine and I went off to my tent setting my alarm for 4 ½ hours time. I am a good sleeper so it was straight off to sleep until woken by my alarm. Up early, it was good to have an excuse not to have a wash and a shave and I packed away the tent, applied some vaseline to likely chaffing points and handed in my drop bags. As we assembled at the start I spotted someone with the same Highland Fling t-shirt as I was wearing. It would have been rude not to give him the customary ding ding that flingers greet one another with. 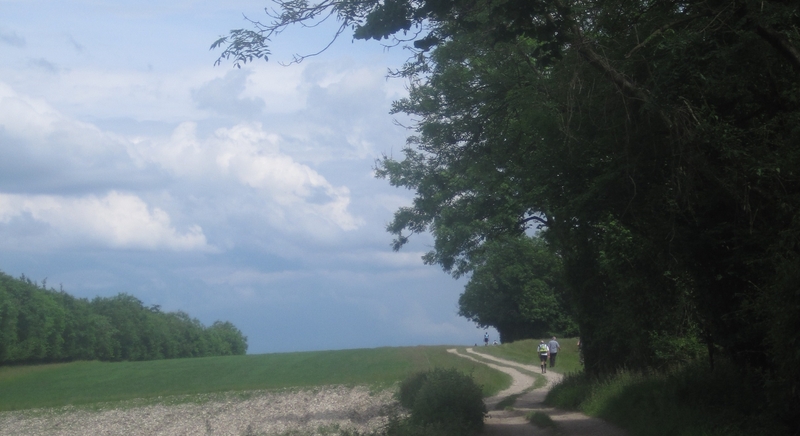 Him and his mate, like me had no other aim other than to finish within the cut-offs and our paths crossed a number of times along the route. It was a misty start to the day so I thought at first it would be nice and cool. Coolish it was but with very high humidity. I sweat absolute buckets even in freezing cold weather and before too long I was drenched. I know to take on plenty of salt so I shovelled down an S! Cap every half hour or so or whenever I remembered it had been a while. I was really enjoying the run, and despite some early overheating my body soon managed to sort itself out i.e. 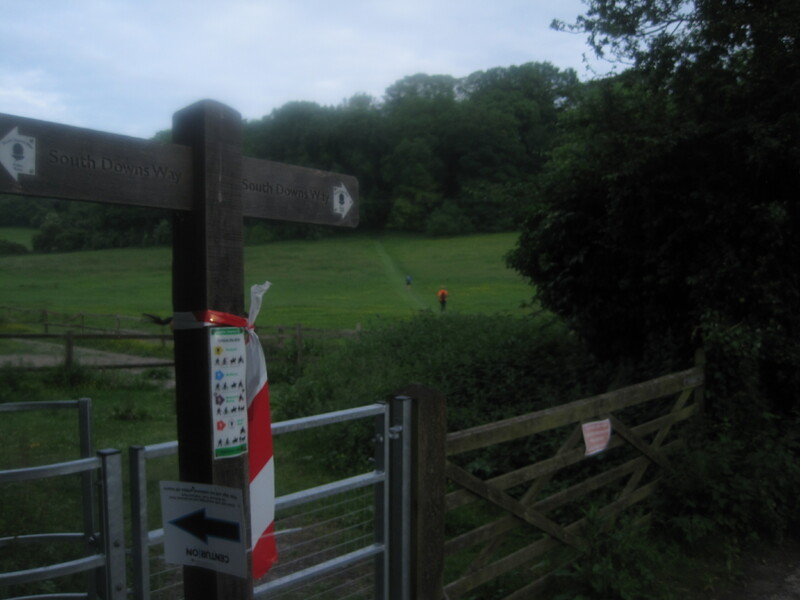 regulate itself, and there was a good lot of banter as we made our way over to the QE Country Park checkpoint which marked the end (in my head) of stage 1. 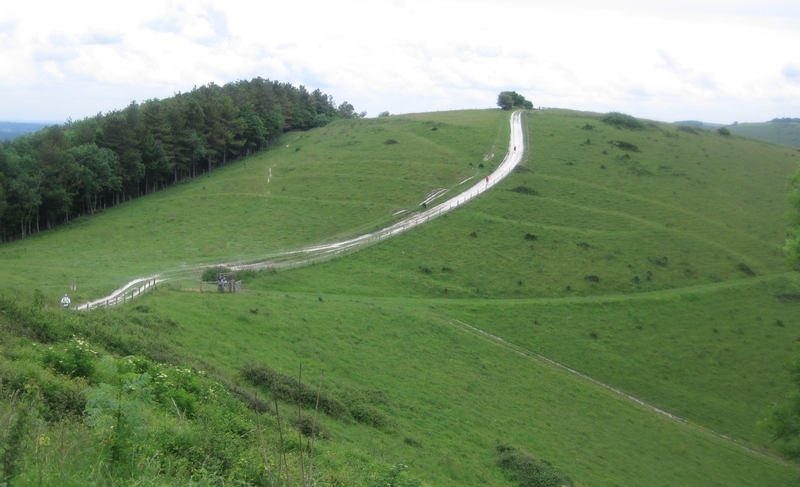 The topography was far better than the North Down’s way. 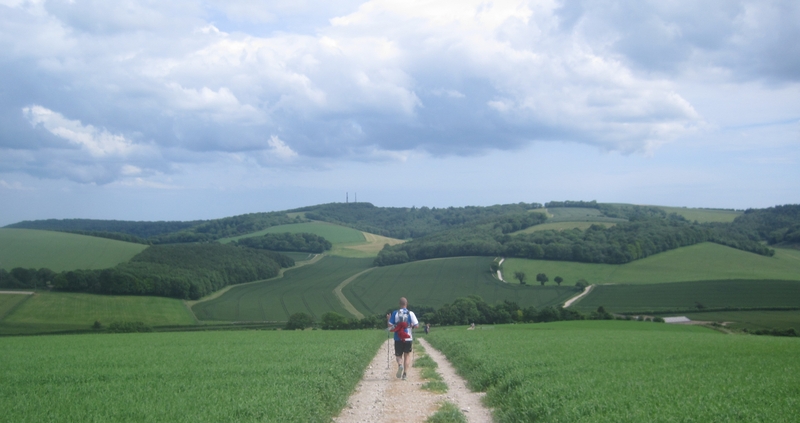 There were long stretches of runnable ground but interspersed with enough climbs for one to have a rest and eat some food while walking up. 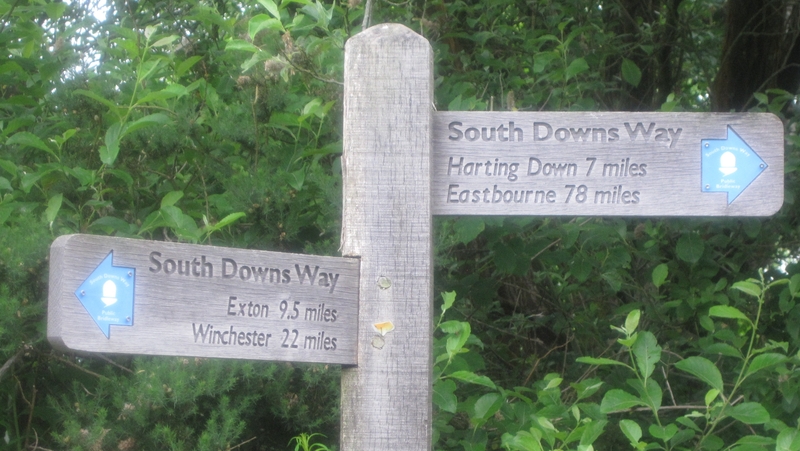 The climbs on the SDW were more undulations along the tops of the downs whereas on the NDW the route did far more up and down the face of the escarpment which often meant steep tiring climbs rather than the chance to have a bit of a rest. 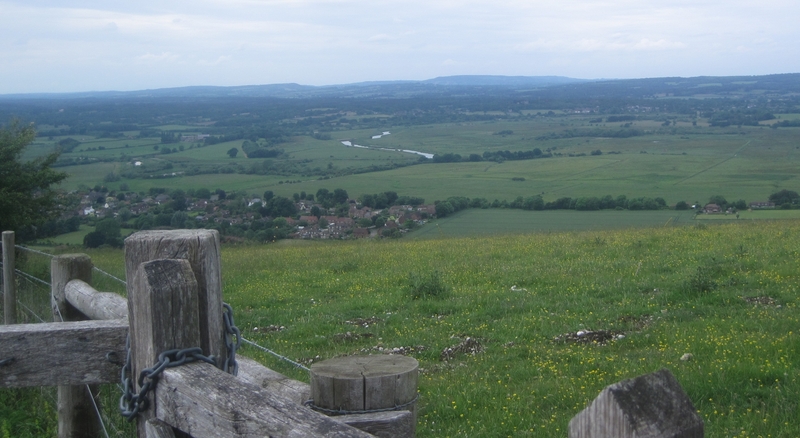 The views were stunning too and you could very often see one’s route stretching far into the distance. I didn’t have anyone meeting me, let alone pacing with me but that meant that I hardly stopped in checkpoints at all. Just grabbing what I needed and then walking off munching. I am not sure if a crew or meeting my family would have actually distracted me from the job in hand. Glatting Beacon way up ahead.. Along the tops a little longer and then down into Washington where my primary task was to have a poo. This, mainly due to general stiffness, seemed to take for ever and by the time I had come out everyone I had come in with had disappeared and after a quick bowl of bolognaise sauce (no pasta thank you) I was on my own for the haul back onto the ridge. Once on the tops though it was nice and level and it was a pleasure to jog along without any pain or other difficulty. 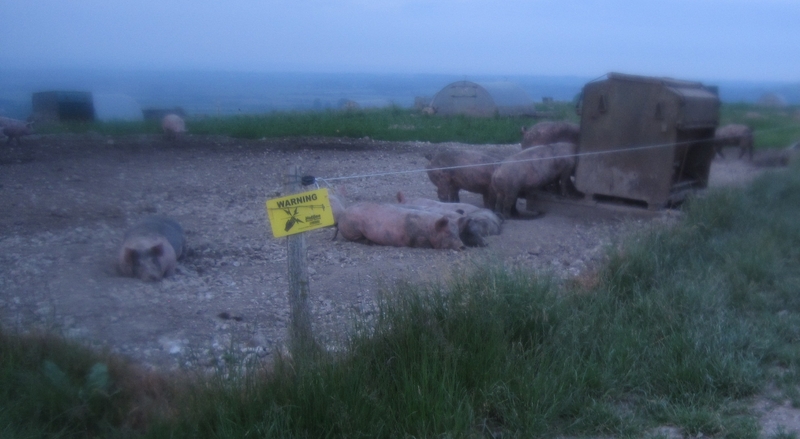 Shortly before the drop to Botolphs and just past Steyning Bowl were a whole series of pig pens fenced off with a couple of strands of electrified wire. Many of them were careering around in circles crashing into one another and just generally having a mad half hour, maybe a final chase about before the dusk turned to night or maybe they were freaking out at the sight of all these humans coming by at such an ungodly hour. 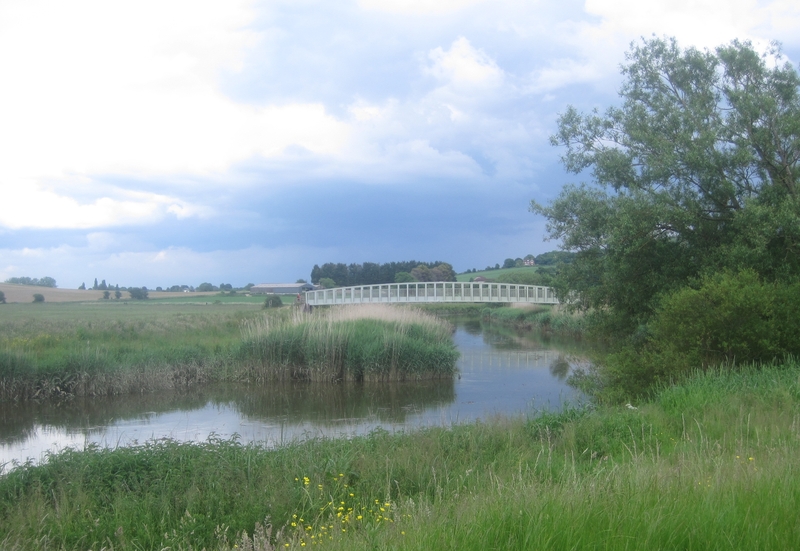 I was now getting tired and it was really good to get to the Botolphs Checkpoint which though just a table under a canopy on the side of a main road had some really nice home baked stuff which really hit the spot. 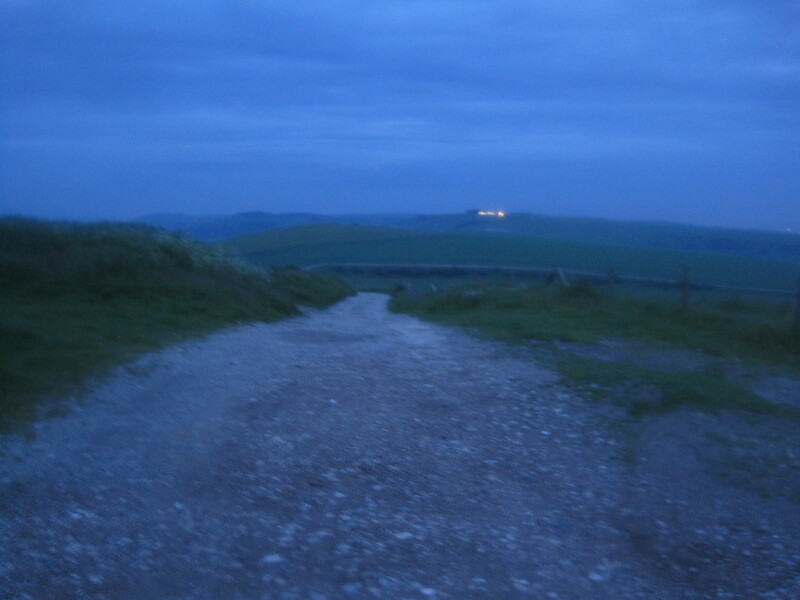 Up from Botolophs and it slowly got properly dark and shortly after Truleigh hill I turned on my Headtorch. This somehow symbolised a new stage in the journey : “The Night Section” and it was if psychologically I had put the previous days efforts behind me and was starting afresh. 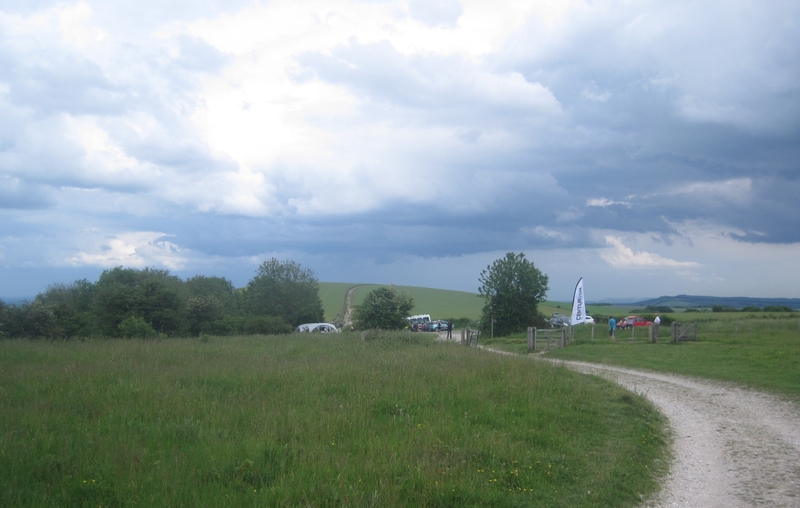 I saw from far away that people were having a bit of a party up on Devil’s dyke, music was thudding out & what looked like disco lights. I was getting nervous as I approached. “I hope the people attending the rave are not going to see a lone runner as a bit of a target” “ Let’s go and trip the weirdo up etc” As I got right up to them it turned out that it was just a few of the SDW100 runner’s crew & supporters out having a bit of fun with glow sticks and the like whilst they waited for their runners to come through (Devil’s dyke being a crew checkpoint it turned out) It’s funny how the mind magnifies what one sees and imagines after 65 miles of running ! 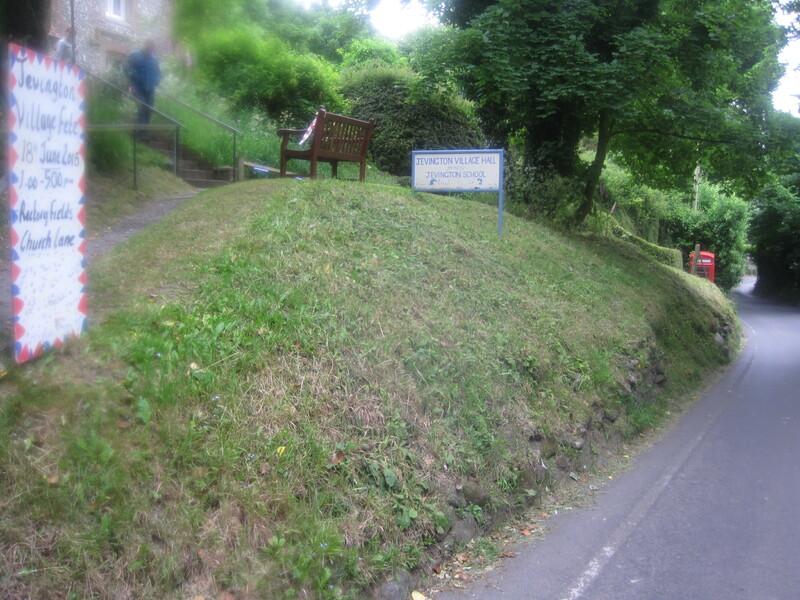 A steep downhill and I was at the Saddlescombe checkpoint. I was really too tired to respond to the volunteers cheerful questions as to how they could help and I somehow sensed that I was failing in my duty to provide the necessary rapport to lift the volunteers in their role of supporting us. I do remember looking around at the strange assortment of farm implements that were lying about and hanging off the ceiling of the olde worlde barn the checkpoint was based in, which was more than a little surreal and rather akin to the film set for an 18th century period drama. 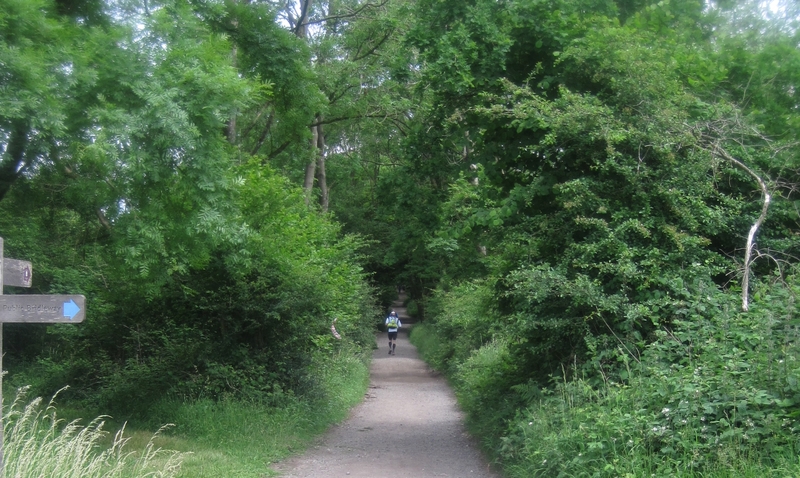 There was a short uphill and then a descent through Pycombe and across a bridge over the A23. From then on it was a hike up to the turn-off to Jack & Jills. (it was really quite runnable but I just didn’t have it in me to do it.) . 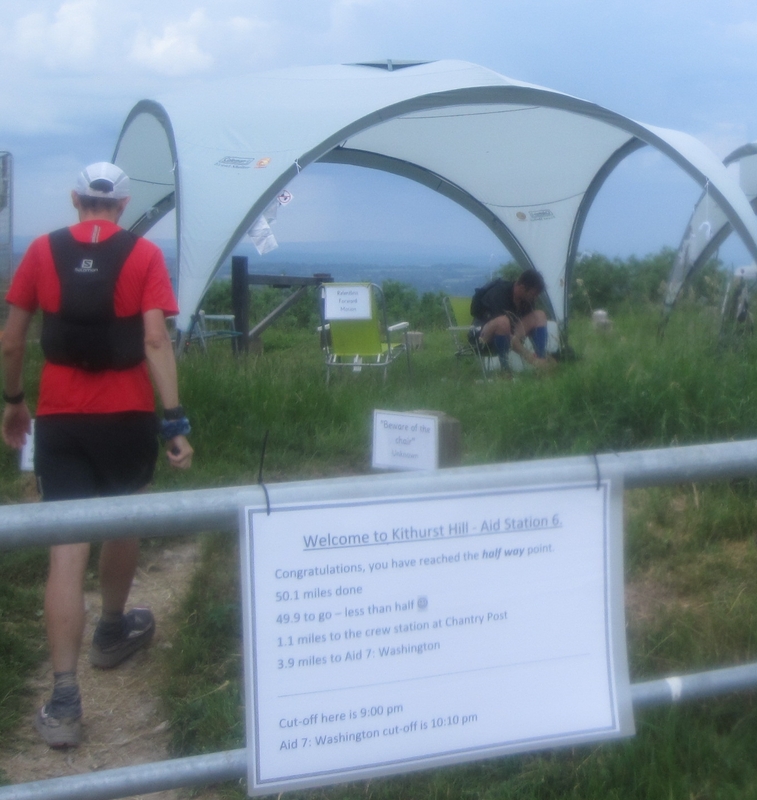 There were marshalls at the fork in the trail where there is an out and back to the Jack & Jill Windmill checkpoint, it was good to say hello and feel that there were people looking out for you. Down to the checkpoint I was totally oblivious to the Windmills which I realise now I must have passed about 10 metres away from in the dark. 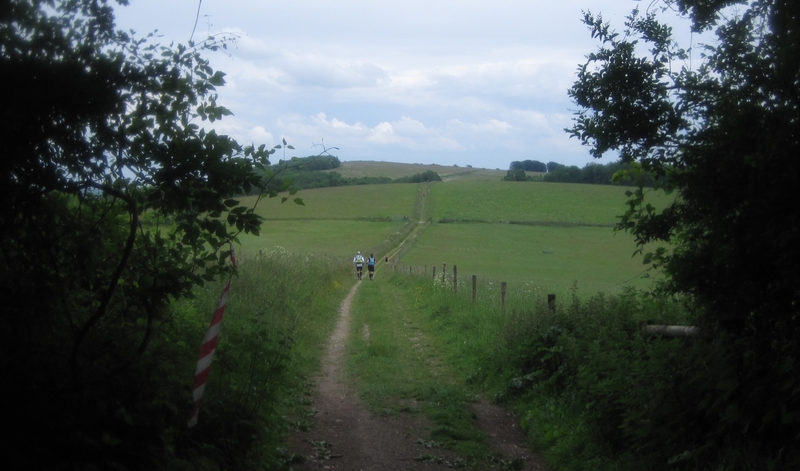 Once at the checkpoint I had a look around, eating a pork pie and subliminally trying to think up a reason for me to dally, but I didn’t have one so on I went. 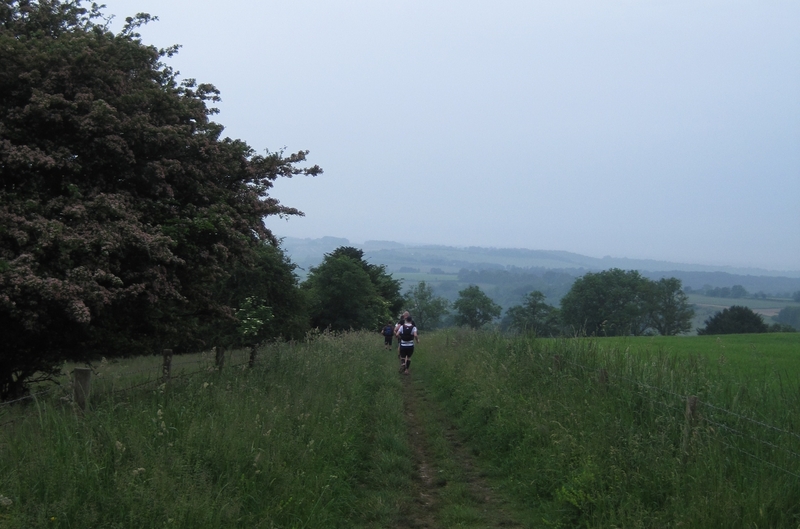 It was decent terrain for the next few miles and I was running and then having walking breaks every now and then. 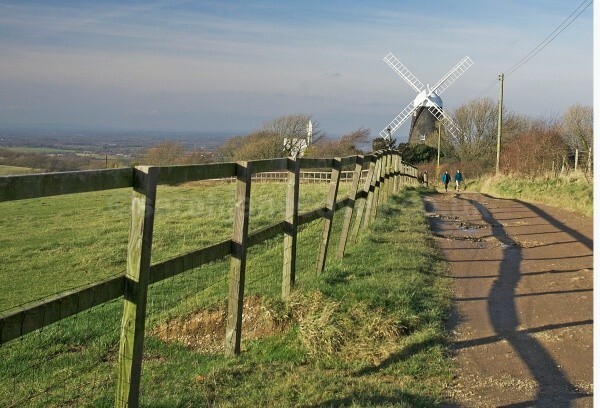 After getting a bit confused as to the way to go at Ditchling Beacon, this being the meeting point of a fair few paths I was overtaken by a couple of guys who were power marching and annoyingly despite running way ahead of them, my walking breaks were resulting in them nearly catching me up. Humph. Shortly after the right turn off the tops on the way down to the Housedean Farm Checkpoint they passed me and it was time for me to play catch up. It would have been about 2am when I got to Housedean and the guys manning the checkpoint were definitely in count down mode waiting for the last 25 or so runners (their estimate) that were left on the course to come through and for the cut-off for the checkpoint to be reached so they could pack up and go home. One chap had decided not to continue and was spark out in one of the deck chairs though the guys reckoned everyone else would push on through as at less than 24 miles to go as they usually only got one or two drops here. I can’t quite remember the detail of the conversation but it was clear that there was none of the “you’ve got this in the bag type of comment” which contrasted with my own internal assessment that I was very much going to do this.. I headed off before the two guys that I had followed in, apologising to my feet who were really starting to hurt. “I am so sorry to have to do this to you, but we have 24 miles to go and you just have to support me through this. I’m really sorry I know it’s going to hurt but I promise to make it up to you once I’m done”. 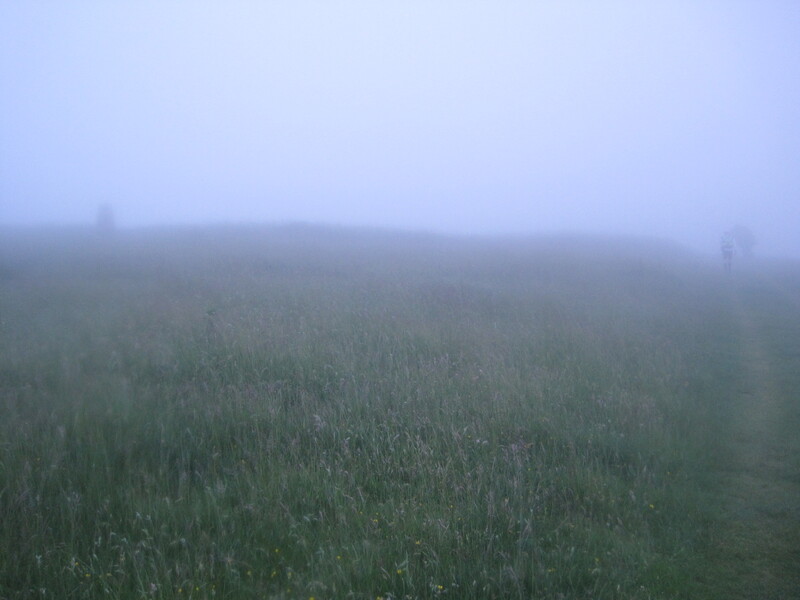 I had gone the wrong way though and annoyingly (though gratefully) was shouted back by the two guys I tried to steal a march on and then followed them up onto the tops, where it was apparent that a thick fog had rolled in. 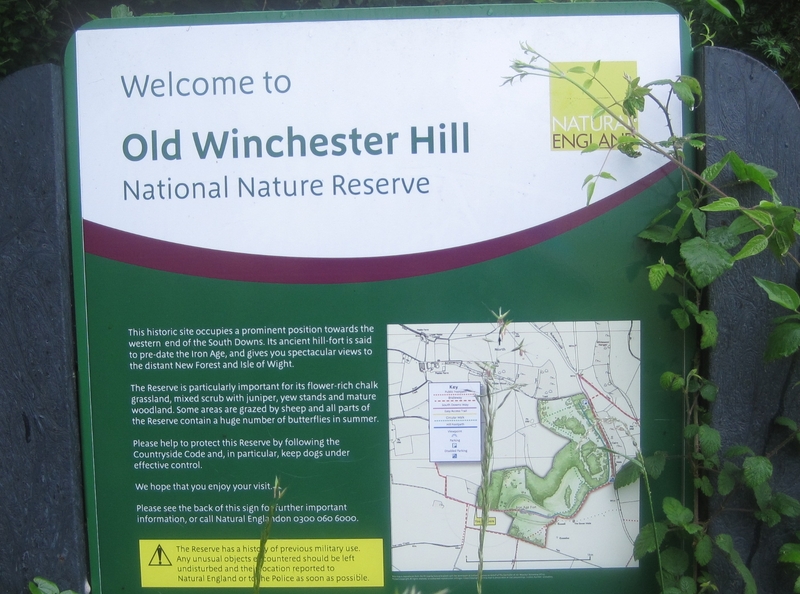 The next section was one that we had been warned by RD James Elson as being tricky to navigate and you could see why as the whole hill was hard chalk with a thin grass covering and no discernable path. 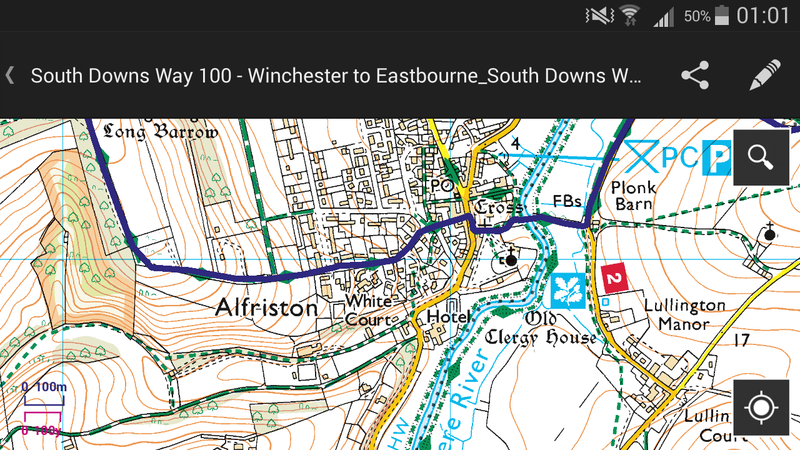 As darkenss had fallen I had switched on my phone and bluetoothed to my Garmin GPS receiver stored in my backpack and then opened up my Memory Map App to the GPX route of the race which overlay some 1:25000 OS map squares which I had downloaded of the second half of the route. I had an instant fix on the detailed map and an arrow that tracked my movement. Having absolute certainty of where I was, was a great psychological boost. I didn’t even want to try and keep up with the two I was following, I didn’t need to. There was something almost womb like about my situation, surrounded by a bubble of light reflecting off the fog but feeling absolutely secure in where I was and where I needed to go. Total Confidence and reliability, so long as the battery doesn’t run out ! My feet were hurting now though and with nothing to look at the pain slowly magnified and managed to push out any other thoughts. I was having to do anything I could think of to distract myself from the pain. anything at all, even to the extent of… (no I won’t go there). Hours later (or so it felt) I became aware of dawn breaking way in front and this not surprisingly provided a lift. 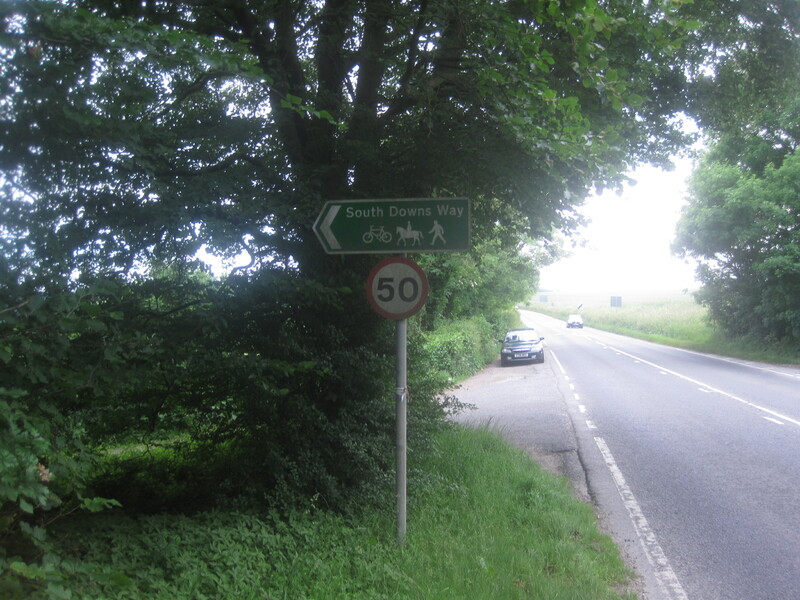 There was a change of terrain too as I dropped steeply off the downs and onto a concrete track that ran perpendicular up to its intersection with the road down to Southease. 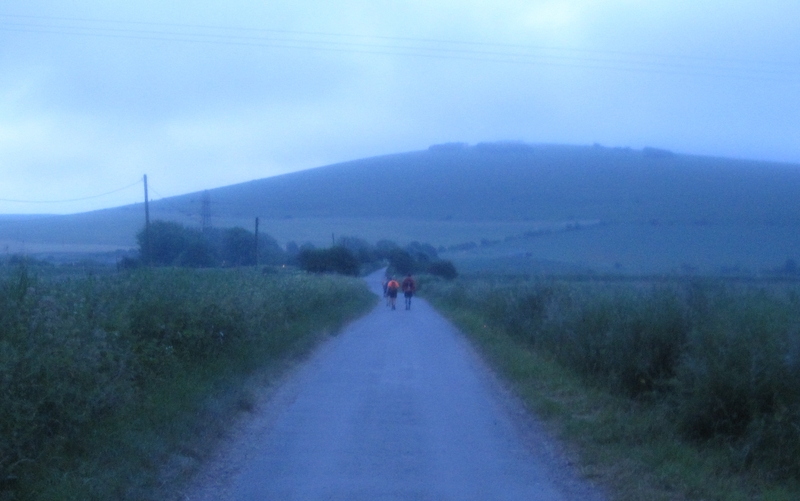 Southease took a long time coming, as I had put away my phone once dawn had come up and had forgotten that the checkpoint was well out beyond southease village. 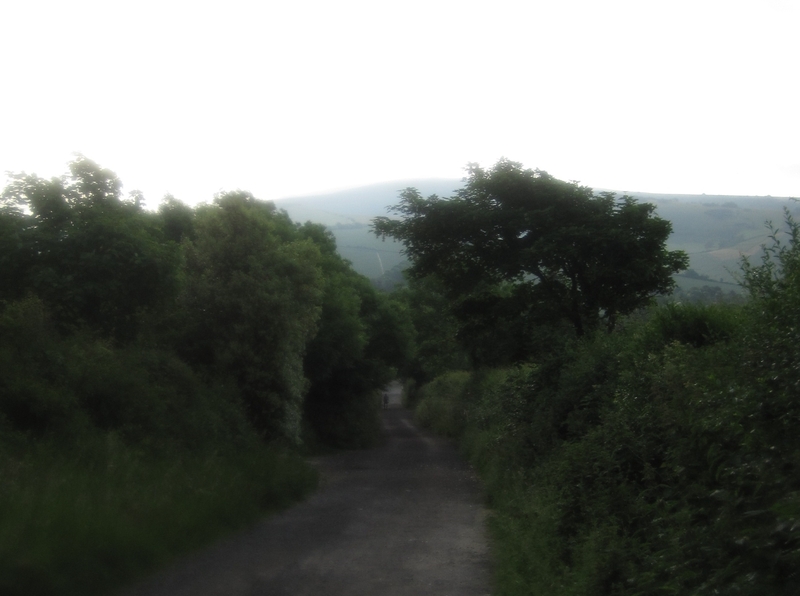 Eventually I was there, up and over the railway line and up the short stretch of road to the checkpoint. It was strange to be with people again, runners and checkpoint volunteers after what felt like many hours alone in my own company. Feeling refreshed mentally (from human interaction) and physically (from a bit of food) I headed up onto the tops with a couple of others. Soon though it was straight into thick fog again and my feet really started to dominate my thoughts again. I was trying all sorts of shuffling/ hobbling styles to minimise the pain. It was actually less painful to shuffle than to walk as it was the balls of my feet that were most affected. This next section was definitely my lowest point. 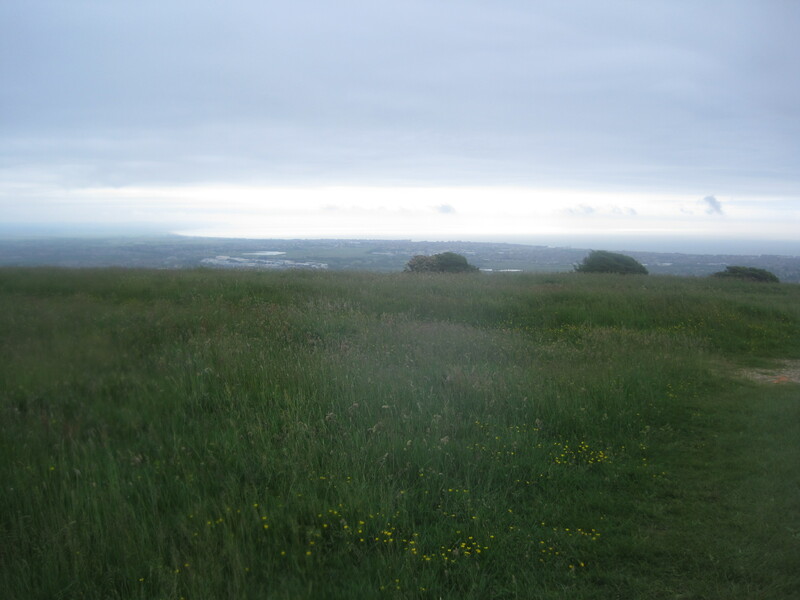 It was daylight but there was a thick fog and I was trudging over thin grass overlaying a hard layer of chalk. It was monotonous and just seemed to go on and on and on. I must have lost a fair bit of time here as I really didn’t care. 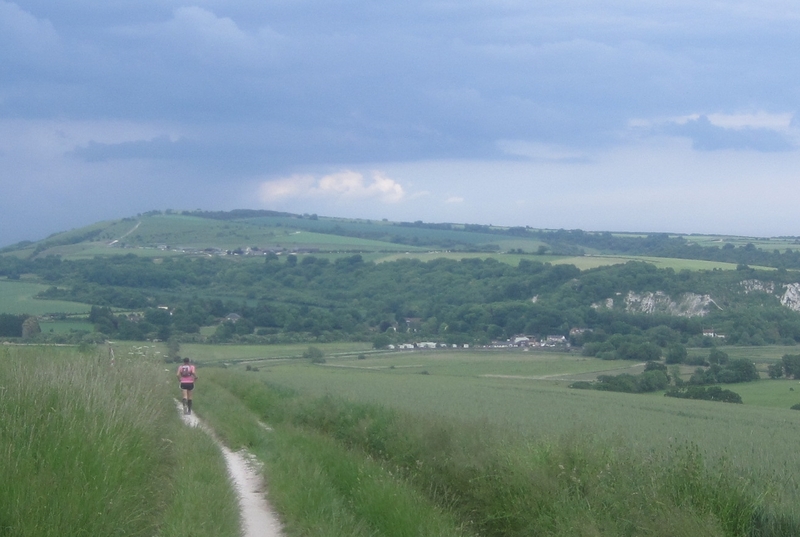 Eventually though, I was on the final downhill, on absolutely rock hard, concrete like, chalk track into Alfriston village. The checkpoint here is in an old chapel with lots of wood panelling and a reverential almost pious atmosphere. It certainly coincided with a major uplift in my spirits. 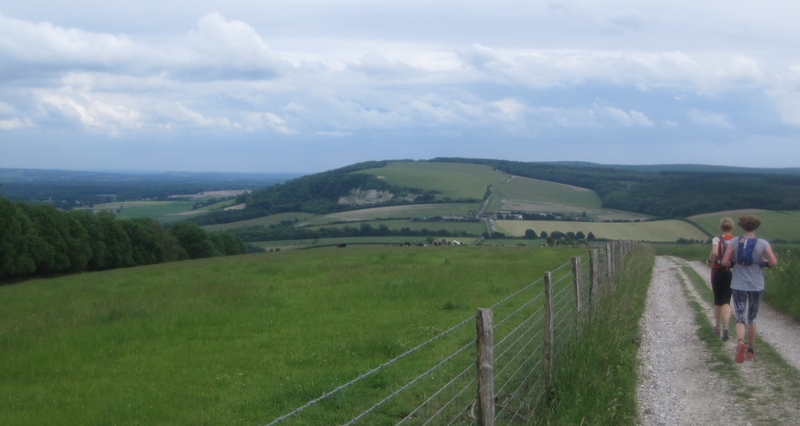 I was into the last 10 miles and I knew, all it was, was an up and over to Jevington and then another up and over into Eastbourne. I am going to do this.. I power marched up the hill rejuvenated, my feet not hurting at all on the uphill. 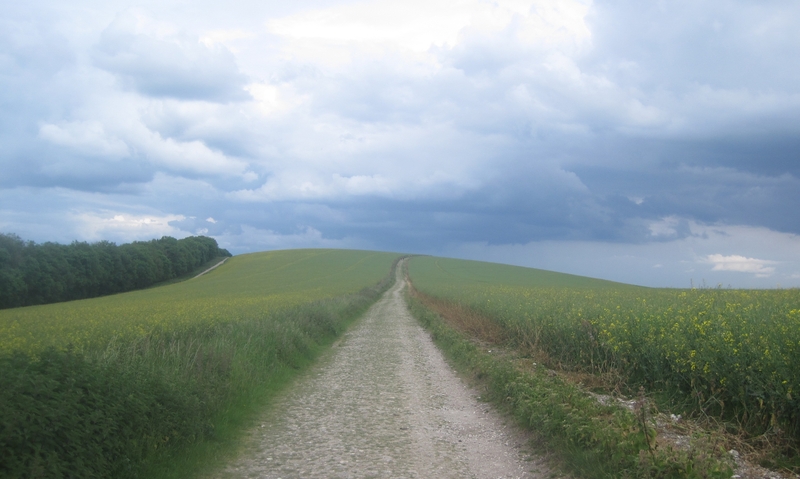 Around and down into Jevington. It seemed to take no time. 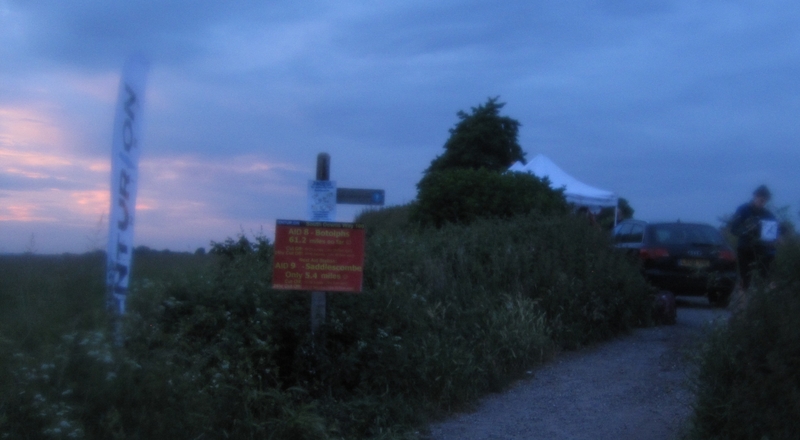 I decided to go up into the Jevington Checkpoint just to have a look around even though it was up some steps and I didn’t really need anything and despite the girl manning the checkpoint who was stood on the road, offering to go and get me anything I wanted. No, I just wanted to have a look in there, my curiosity was back. Mind you, my quads were none too comfortable coming back down those steps ! Along a small stream and then up again, still very easily. 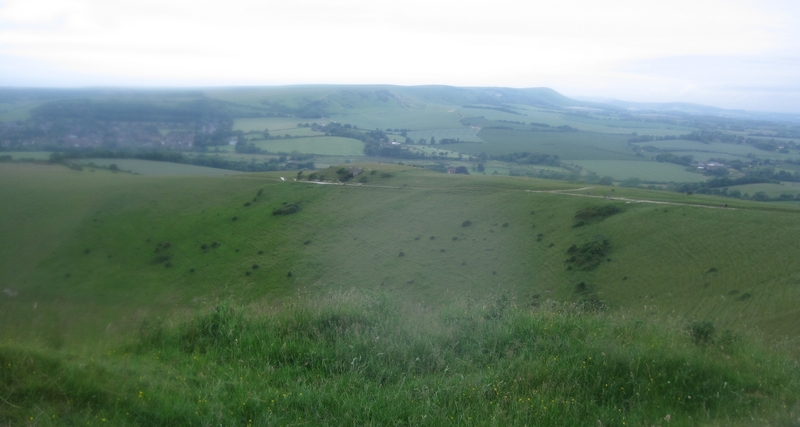 Soon I was on the tops and off to my left (not quite where I had imagined it) there was a girl sitting astride the trig point who cheerily pointed the way to the correct path down into Eastbourne. It was narrow to start off with and I came across 2 or 3 fit young blokes being escorted by their pacer’s who had had the misfortune to suffer from a serious injury of some sort or another and who were stoically inching their way down, hats off to them I thought (and said) and I felt almost guilty for having had such a trouble free journey. Almost there now and it was a matter of trying to maintain my posture and style (ho ho) as I ran through Eastbourne, motorists tooting their admiration. The rain started to come down heavily, but it wasn’t as far as I thought before I was there… at the turn off for the Sports Centre and the final lap around the track. Through the finish gantry I was given my medal and the guy with the specs who had been out taking photos the day before (who I now realise was Stuart Marsh), got me into position to take a couple of finishing photo’s. I’d done it ! 27 hours 47 minutes. Soon enough it was time to get onto the (centurion organised) bus for the journey back to Chilcomb. I managed to get some sleep and woke up as we came to a stop. Into my car and it was a short 15 miles or so down the road to visit my ageing aunt mary who lived in a suburb of Southampton (Portswood). After a brief misunderstanding, having being taken for a parcel delivery man, I was allowed in. Regrettably, despite my best entreaties I was unable to persuade my aunt to go out for some (celebratory) food. instead I had the benefit of Wiltshire Farm foods (i.e. Meals on wheels) and their exemplary finest shepherd’s pie (a gloop of mince, gravy and mashed potato) Fortunately I had had the foresight to stop off for some celebratory beers before arriving which went some way to ease my ravenous appetite. I was off to bed comparatively early @11pm.and with the alarm set for 5.30am I managed to make a work meeting scheduled for 10.00am in Leeds. Back to reality, was all that running just a dream ? 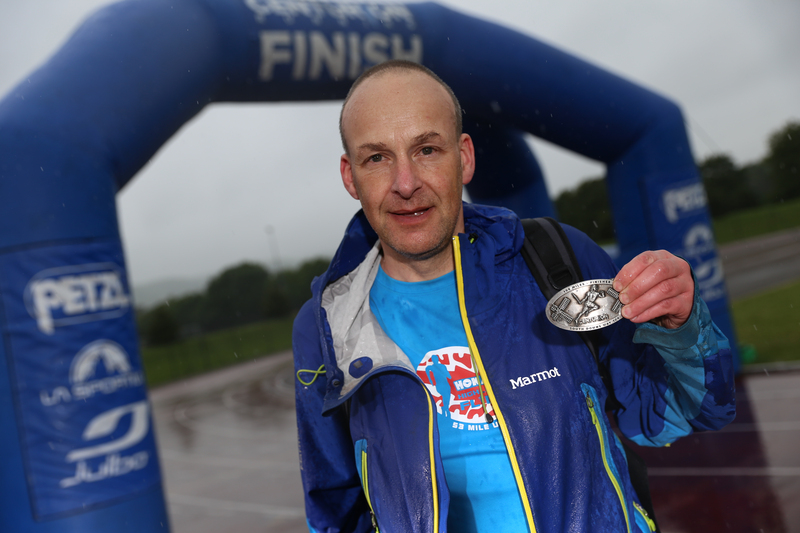 From someone that has always run…but never done an ultra.